What Do Snakes Eat and Do Snakes Have Any Predators? Although the smallest snakes are no larger than worms, they are all predators. Small snakes eat insects. Larger snakes eat rats or squirrels or rabbits. The huge pythons and anacondas can swallow a deer. Some snakes use poison called venom to catch animals. They deliver their poison with a bite. Others are constrictors, which means that they wrap themselves around their prey and suffocate it. Still other snakes eat bird eggs. 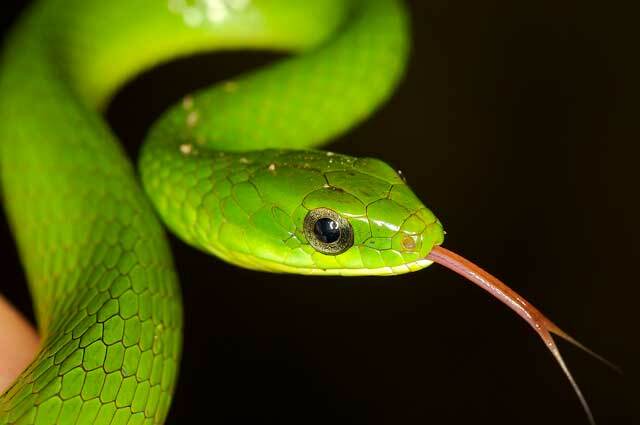 Snakes swallow their food whole, without chewing. The jaws may be hinged so that the snake can eat something larger than its own head. A snake that has just eaten may not need another meal for days and days. Snakes are eaten by big birds such as eagles, hawks, and owls. The Indian mongoose (a mammal) kills cobras. Wild hogs stamp on snakes to kill them. And, of course, many people kill snakes on sight. Most snakes avoid people and won’t hurt you if you don’t bother them. Still, it’s a good idea to leave wild snakes alone. Do Tree Monkeys have any Predators that can Catch and Eat them High up in the Trees? How Many Natural Predators Do Wasps Have and Why Don’t Birds and Other Animals Die When They Eat Wasps? How many of Australia’s 140 Species of Native Snakes are Poisonous and Do They Include Sea Snakes?